If forced to leave, it is unclear where exactly the refugees would go since reports indicate intensifying persecution in Myanmar. 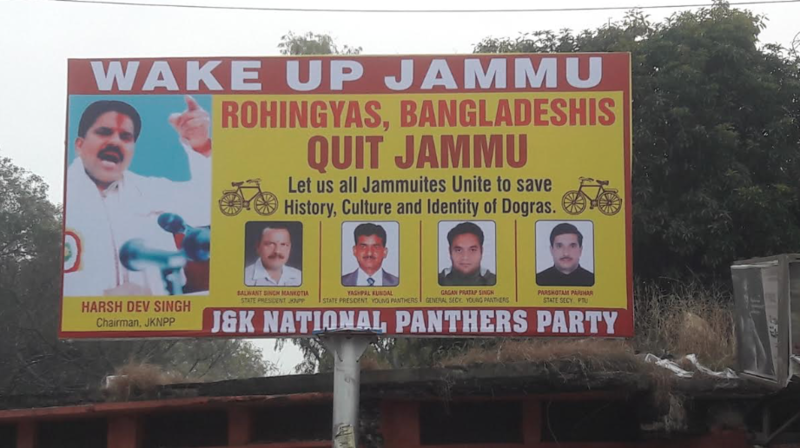 The main man behind the signs is Harsh Dev Singh, chairman of the Jammu and Kashmir National Panthers Party, but he is only the latest to launch a discriminatory campaign against Rohingya Muslims – often called the ‘world’s most persecuted minority’. The hoardings are part of what is turning into a systematic campaign that is demanding the removal of Rohingya and Bangladeshi refugees from Jammu and Kashmir. In an interview to The Wire, Bhim Singh, the party’s leader, cited Article 370 of the Indian constitution as one of the reason’s for the party’s opposition to the Rohingya presence in the state. The article essentially grants Jammu and Kashmir more autonomy in relation to the Centre than other states are afforded, thanks to the instrument of accession. According to Bhim’s interpretation of the article, allowing any non-Indian to take up residence in the state is a “total violation of the constitution” because the document of accession does not permit foreigners, whether they be Rohingya Muslims from Myanmar or West Pakistan refugees, to live in Jammu and Kashmir. These are the concerns that are propelling the JKNPP’s campaign, he says. In fact, Article 370 and a host of state laws place a bar only on land ownership and permanent residency, not on the ability of outsiders to live and work in the state. On January 29, Harsh Dev and other members of his party took to the streets wearing black banners that read: ‘Bangladeshi and Rohingya Immigrants “Quit Jammu”. Speaking to reporters at the protest, Harsh Dev said,”“It is [a] conspiracy to to reduce [the] Dogra population to [a] minority in their bastion Jammu by engineering demographic changes,” according to the Indian Express. In a video from the same protest, Harsh Dev also told various media outlets that the Panthers party is strongly opposed to the “illegal resettlement” of the “thousands and lakhs” of refugees that end up Jammu as they flee violent persecution in their home countries. He also said that the refugees are a “security threat” to India and that intelligence agencies have termed them a “ticking time bomb”. How much truth do these statements hold? According to the UN Human Rights Council, as of December 2014 there were a total of 14,300 refugees form Myanmar legally registered with the UN in India, of whom 2,970 were asylum seekers. As for unregistered refugees, in 2014 Al Jazeera reported, “According to the United Nations refugee agency (UNHCR), thousands of unregistered refugees are living in elsewhere in India.” So far, there have been no reports putting the number of Rohingya refugees in India near “lakhs”. The issue has also come up in political debates in the recent past. Late last month, Jammu and Kashmir’s chief minister Mehbooba Mufti provided a written response to a BJP MLA’s questions on the number of Rohingya Muslims present in the state, saying, “5,743 Burmese (Rohingyas) are staying in the state and no instance of radicalisation has been reported among them so far” according to the First Post. She added that the refugees are mostly concentrated in the Jammu and Samba districts and there have been no reported instances of radicalisation in the community. She added, “17 FIRs have been registered against 38 Rohingyas for various offences including those related to illegal border crossing,” according to the Indian Express. Since Myanmar refuses to recognise Rohingya Muslims as citizens, they are uniquely stateless, unable to lay claim to any of the civil rights that are guaranteed by one’s nation. Apart from making them vulnerable to blatant persecution in Myanmar’s Rakhine state – where Rohingya Muslims form the majority of the population – this statelessness makes them peculiarly vulnerable as refugees too. This leaves Rohingya Muslims particularly vulnerable to arbitrary arrests under laws like the Public Security Act as the government figures out what to do with them. A law exempting Pakistani and Bangladeshi religious minorities fleeing persecution from being prosecuted under the Foreigners and Passports Act has not been extended to include religious minorities from Myanmar. Bhim Singh thinks the state government and Border Security Forces are at fault for allowing the Rohingya population to grow over the past ten or so years. Echoing some of Harsh Dev’s sentiments, he added that the government places Rohingya refugees in Jammu, not Kashmir because Jammu has a more “mixed culture” which allows outsiders to pass as nationals in a way that is not possible in Kashmir. Bhim is disgruntled that the Hindu-majority region has been chosen for the refugees. He also suspects that the Rohingya Muslim settlements are part of the “Anglo-American conspiracy to create a crisis in Jammu and Kashmir.” Referring to the “Dixon Plan,” Bhim said that the US wants to create a vertical division in the state. Closer home, the status of Rohingya Muslims in Jammu has become a point of contention between the coalition state government and the BJP at the centre. The Rohingya Muslims have been roped into an argument about granting identity certificates to refugees from West Pakistan who have arrived in India when the country was partitioned. While the BJP has sought full citizenship rights for the multiple generations of Hindu refugees who have been living in India for decades, the laws of Jammu and Kashmir do not allow full domicile rights for refugees who are not from the undivided state of J&K. The BJP’s stand is that the state government ought not to deny permanent residentship to people who have effectively been in India since the time of partition. Harsh Dev too seemed to echo these biases in the statements he made on January 29, when he said that Rohingyas are “known” to be of a “criminal background” and have violently attacked Buddhist communities in their native Myanmar. While no other political parties have come forward with official statements about the JKNPP’s actions, in December National Conference president Farooq Abdullah responded to the BJP’s rhetoric about hosting refugees: “If it is a Hindu, they will accept it. If it is a Muslim they will not accept it. When it was a Kashmiri Muslim living and settling here, they were saying this is demographic change we are bringing about” according to NDTV. Zahid Hussain, who arrived in India with his family in 2009, told NDTV in December, “We get good wages, the vegetable market is close by, we get the things very cheap, that’s why we prefer to live in Jammu.” But even then, the community was reeling from a “mysterious fire” that had destroyed 80 of the homes that they lived in. Back in 2014, Al Jazeera reported how most Rohingya men in Jammu had turned to dealing in scrap since there was no other employment available. Their children helped them collect scrap and most women from the community worked 12 hour days in the state’s walnut factories. Mohammad Rafik, who was 48 at the time told Al Jazeera, “We have been forced to be scrap dealers as there are no employment avenues available. A large number of refugees here are unregistered as there is a long process to get your name registered with UNHCR who provide an registration card. While Harsh Dev told First Post that his party will take action if the refugees don’t leave themselves, it is unclear what his, the BJP’s or the state government’s next steps will be. The Wire‘s efforts to reach him were unsuccessful. If forced to leave, it is unclear where exactly the refugees would go since reports indicate intensifying persecution in Myanmar, while Bangladesh – which hosts the majority of Rohingya refugees – recently announced plans to relocate refugees to an island that has been termed “unliveable”.